You know when the soft white cotton gloves come out that Bern based Angular Momentum and Manu Propria have been busy on another major watch project. And this time their labours have produced a stunning addition to their Émail Lumineuse sport watch collection. Magnus Junior Bronze Diver is the smaller brother of the mighty 70mm Freehand Magnus diver. 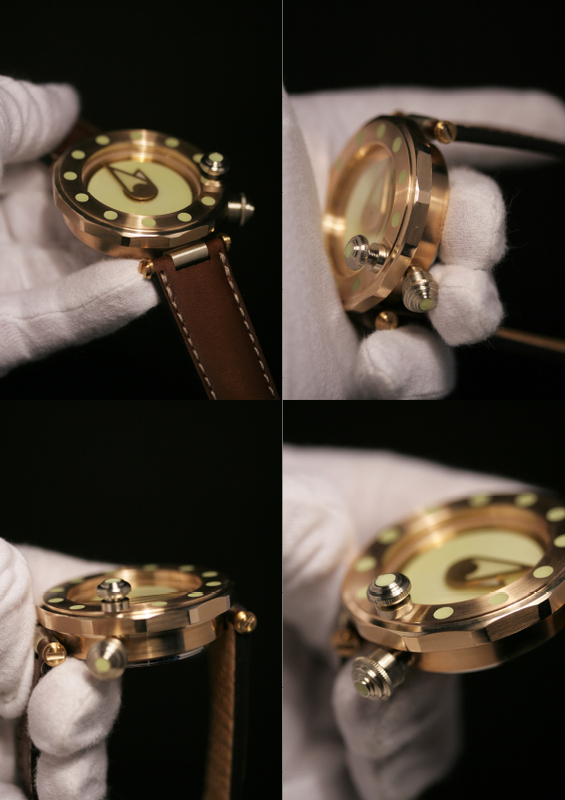 The striking and large 48mm watch is made entirely from Aluminium Bronze. 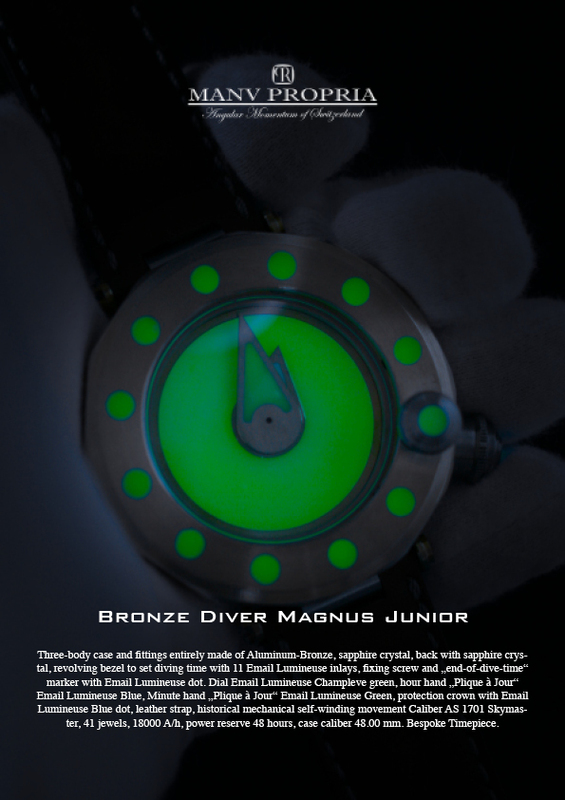 The watch lights up under water with what is known as 11 émail luminuese inlays, with an ‘end of dive émail luminuese marker to indicate when it’s time to head to the surface. 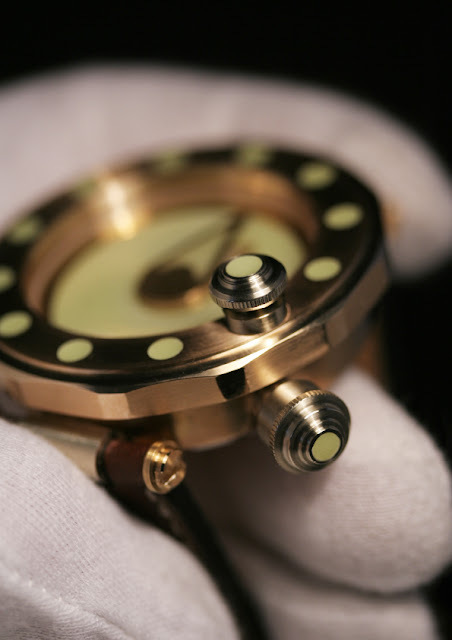 Independent artisan watchmaker Martin Pauli is the inventor behind Émail Lumineuse. Inspired by bioluminescent mushroom species known as Mycenas. It is said to be more intense than Super-LumiNova and packs up to 35 hours of glow in just 10 minutes of charge. This special enamel alloy is non-radioactive and Angular Momentum boasts that their lume tech will last for centuries. The watch is powered by a self-winding calibre AS 1701 Skymaster movement with a 48 hour power reserve. The watch is something that wouldn’t look out of place in Jules Verne’s Voyage to the Bottom of the Sea. The pictures, like the watch, are a thing of beauty.